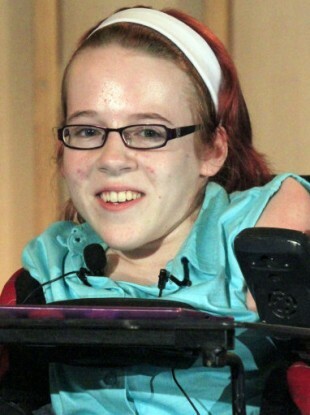 Joanne O’Riordan, the 16 year old Cork native who was born without limbs, has her sights set on One Direction recording a new charity song that will partially benefit her. Last month, O’Riordan spoke at the United Nations in New York City beseeching delegates to build her a robot. The Irish Examiner reports on the teen’s courageous and inspiring efforts. The song that O’Riordan would like recorded has already been written by Grammy award winner Julie Gold, who also penned ‘From a Distance.’ Gold’s new song, ‘No Limits’ is inspired by O’Riordan’s struggles. "A section of the song is based on Joanne’s life," Joanne’s brother Steven said. "It talks about how Joanne’s heart, spirit, and mind has helped her to get where she is and achieve what she has achieved. Steven is also working on a film documentary about Joanne’s life, which the family hopes to be completed by next year. "We are basically looking for an international superstar,” said Steven about the new song. “We are chasing One Direction [but] nothing has been agreed." Joanne has compiled a top twenty list of performers she would like to see attached to the song, but currently One Direction is topping that list, while the cast of ‘Glee’ is also included. "The aim is that this will be a big thing," Steven said. The Irish Examiner reports that the new single would be released in a number of countries, while the O’Riordan family have decided that a portion of the money raised will be donated to the ISPCA and Pieta House. Most of it, however, would be used to develop a robot for Joanne, who is wheelchair bound since she has no limbs. While speaking at the UN last month, O’Riordan received a standing ovation as she said: "I want to live an independent life just like you. I don’t want to live in the shadow of others, because I want to make my own journey in life, and I know if I’m given that chance I can and will succeed." "This robot would become my hands and legs,” said O’Riordan.